EDITED: Note – The portion of this post that reflects the biblical text has been highly edited from the original version in order to remove a lot of technical language, and the 7th day of creation in Genesis 2:1-3 has been added. The first part was done at the suggestion of my son, Victor. The second part was done at the prompting of Dr. Walton who, after reading this at my request, sent me a note to remind me that the 7th day is the most important one. I think you’ll see why if you read it to the end. There is now video added to the end of the post below so that you can hear and see the ideas in a fresh way. 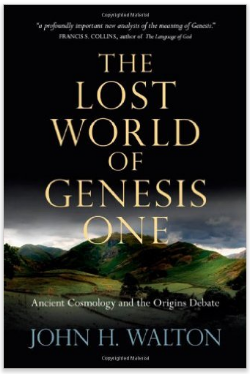 The interpretive reading of Genesis 1 that follows is based on my reading of Dr. John Walton’s incredible book, The Lost World of Genesis One. I have been working on this for a couple of years, and I finished it today. For better or worse, here is how I understand what Walton is proposing. Following Walton’s interpretive rationale, the reader will see that materiality (viz., the creation of the material universe) is not the focus of this interpretive reading, but rather functionality, purpose, and order in a world that was created to be inhabited by God and people together. 1 This is the account of how God began to bring the heavens and the earth under his divine rule, and to make them a dwelling place, a habitation, and a cosmic temple filled with his presence. 2 Before this time the whole world was a barren wasteland in the darkness of chaos. God’s Spirit hovered over the cosmic waters, but things were not yet as God intended them to be. Then God set out to do his good work in the world. 3 First, God spoke: “Let the light that shines upon the earth have its good purpose.” And it was so from that day forward. 4 Now, God determined that the good purpose of the light was to distinguish the darkness from the light upon the earth. 5 He said, “From now on the time of light is day, and the time of darkness is night upon the earth.” This marked the first time that God had measured a full day of darkness and light upon the earth. 6 But then God spoke again. He said, “See! There is a division between the sky that stretches out above the earth and the oceans below.” 7 For it was God himself who had created the sky above, from which the rains fall down upon the earth, just as he had also created the seas below. 8 God said “The sky covers the whole earth.” A second full day of darkness and light passed upon the earth. 9 Yet again, God spoke. He said, “The great bodies of water and the great masses of dry ground both have their own places upon the earth.” 10 He said, “The dry ground is the land and the great bodies of water are the seas.” From God’s own perspective, both the seas and the land were integral parts of his good creation. 11 After this, God spoke again. He said, “The land produces vegetation. There are plants and trees that grow fruit from the seeds that are in them. I have made them such that they can reproduce through the seeds that are in them.” 12 Now, all of this is why the vegetation continues to grow upon the land with each kind of plant reproducing again and again. It is another way that God has brought goodness into his creation. 13 A third full day of darkness and light passed upon the earth. 14 God spoke again. This time he said, “There is a purpose for the great lights in the sky. These separate the day from the night. By them you will be able to measure the cycles of the seasons, the passage of days, and the passage of years.” 15 God said, “They will always remain in the sky to shine upon the earth,” for it was God who made the world to work in just this way. 16 The greater of the two lights in the sky provides the light for the day time, and the lesser of the two lights provides the light for the night time. The stars are also part of the way God provided light. 17 It is God who set the lights in the sky to provide light upon the earth, 18 and to serve as a means for measuring day and night, and to separate light from darkness. This was another way that God brought goodness into his creation. 19 A fourth full day of darkness and light passed upon the earth. 20 God spoke again. He said, “I made the water creatures so that they could live in the bodies of water. I made the birds so that they could fly in the sky.” 21 Thus, it was God himself who determined where each type of creature lives in his world. That includes every creature that lives in the water and every kind of bird as well. All of this was another way that God brought goodness into his creation. 22 For it was God who made them so that they could reproduce according to their own species. In this way, God saw to it that the oceans and the skies would be filled with the amazing creatures he made. 23 A fifth full day of darkness and light passed upon the earth. 24 Then God spoke again. He said, “The dry land will be home to all kinds of land animals. That includes livestock, crawling creatures, and even the wild animals. I have put them into my world.” That is why all of these creatures are in God’s world. 25 God also made these creatures so that they could reproduce according to their own species. In this way, God brought yet another measure of goodness into his world. 26 The next time God spoke, he said, “Human beings have a special place in my world. They will be my representatives in the world. I have given them authority to rule over every creature in the animal kingdom. 27 And so it was God himself who made humans – both male and female — to be his representatives in his world. 28 God said to them, “You also reproduce. You and all your offspring are to go into the whole world and bring it under my rule through the authority I have given you.” 29 He also said, “You will always have what you need to eat because I have made the plants and trees so that they can reproduce food for you 30 and for every other kind of creature in the world.” This is how God established his world. 31 When God looked at everything he had done, and when he surveyed all of the ways he brought goodness into his world, he said to himself. “This is a very good world that I have made.” A sixth full day of darkness and light passed upon the earth. Day 7 – God finishes building his cosmic temple. His presence rests in his creation. 1 After all of this, God’s good world — the heaven-and-earth creation — was ordered in just the way God wanted it. 2 On the seventh day God’s presence came to rest in his creation and he took up his residence there. 3 Therefore God declared that the seventh day was always to be blessed and remembered above all others because it was the day he finished bringing order to his good world and made it his own home.